Now would be a perfect time to get new floor mats for your Toyota. We offer three types of Floor Mats. 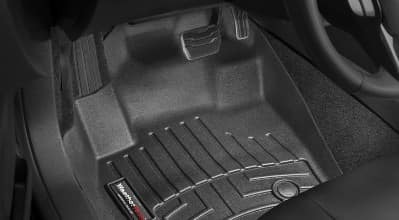 WeatherTech Liners: These floor mats are laser-measured to precisely fit any Toyota model like the Toyota Rav4. These liners are manufactured with a harder resin and designed to give you the ultimate in interior floor protection. All-Weather Floor Liners – Toyota all-weather floor liners offer superior protection for your interior. They cover the floor and surrounding edges on all sides to help keep the floor clean and dry. Precise OEM measurements help ensure a perfect fit. They are designed to channel snow, water, mud and debris away from your shoes and clothing. 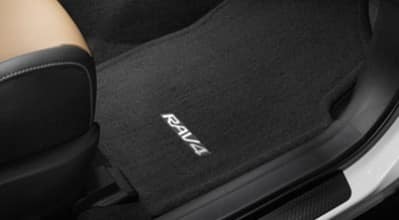 Carpet Floor Mats – Toyota carpet floor mats are made of a long-wearing material to dress up your interior. Protect your Toyota vehicle investment and order your floor mats today. For more information on our Floor Liners, Floor Mats or any other Genuine Toyota Part, contact the Maplewood Toyota Parts Department today. Have a Service Appointment Scheduled? 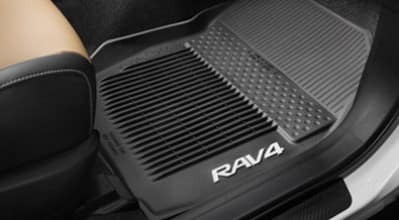 Have your floor liners installed during your next Service Appointment.